THanoiTower is an interactive game to solve Hanoi Tower puzzle. The Tower of Hanoi is a mathematical game. THanoiTower provides two versions of the game. There are three rods and a number of disks with different sizes. Initially all disks are on one rod in the original version. In the modified version, initially all 3 rods have same number of disks. The objective of the puzzle is to move the entire stack from one rod to another one. THanoiTower Free Download - we do not host any THanoiTower torrent files or links of THanoiTower on rapidshare.com, depositfiles.com, megaupload.com etc. All THanoiTower download links are direct THanoiTower download from publisher site or their selected mirrors. 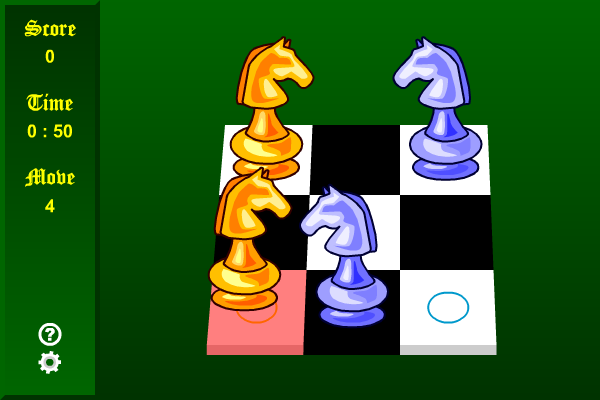 Exchange the positions of the knights on the chessboard. Connect the north with the south to clear the field. Play lots of free Sudoku puzzles on your PC without using pen and paper. Reorganize the lines and get rid of confusion. Remove matches to form the required number of squares. Match Pairs is a memory game which you need to match pair of cards. Form words crossword-fashion. Words must connect to the last word played. Block Puzzle has simple game rules.Play now for free,everyone can enjoy. The 1st letter acts as a locomotive; use it to attach letters to form words. THE ULTIMATE MATCHING PUZZLE GAME WITH UNIQUE MAGIC POWERS AND BOOSTS! Create a chain of linked words; each word shares letters with other words. Anagram letters in the board's bottom row; empty cells filled from rows above.